January 2, 2017 – Hello, Happy New Year! This week, our time machine turns tower crane, as best-selling author and historian Hugh Howard introduces us to two men whose vision for building shaped the 20th Century. 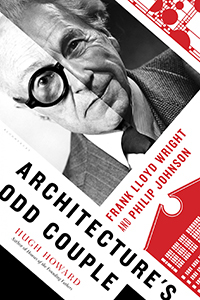 His book is, Architecture’s Odd Couple: Frank Lloyd Wright and Philip Johnson . Conducting the interview is Thriller author and practicing architect Tom Grace, who previously interviewed Gerald Posner, author of God’s Bankers: A History of Money and Power at the Vatican . Mr. Howard’s numerous books include Mr. and Mrs. Madison’s War: America’s First Couple and the War of 1812 ; The Painter’s Chair: George Washington and the Making of American Art ; Thomas Jefferson: Architect ; and the classic Houses of the Founding Fathers . You can find him online at HughHoward.com, and follow him on Twitter @HowardHistorian.